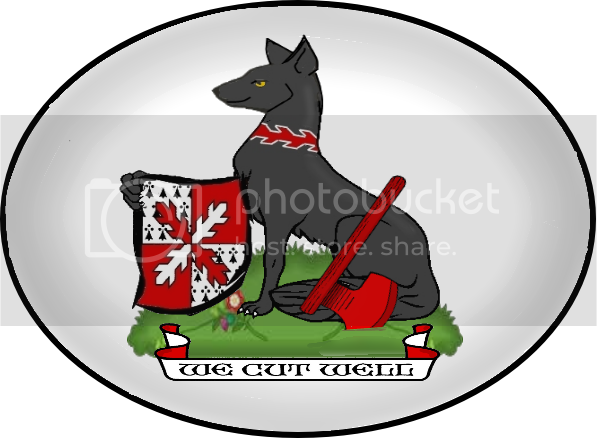 This is a design of my arms held by the fox of my crest, not as a supporter, but as a "demounted" holder. That might make a good book-plate. I suppose to be ultra-pedantic one might say that it suggests a single supporter, to which you have (and claim) no entitlement, and that the proportions between the animal (dog, wolf?) and the shield are odd (shield/animal 1/3 rather than 1/1), but the poor animal could hardly hold up a shield as big as itself. Nice, just a thought it does look like a supporter but assuming you are in a Country without an official state Herald would it matter if you assumed a supporter? I wanted two bears supporting my coat of arms but the South African state Herald said it was not permissible........tradition I suppose. Perhaps a comparison to my actual crest would be useful. nice picture, and just from the composition of the picture it is clear that it is not a supporter (well to me anyway). I think that the first picture could be improved by making the tail erect, it may have the effect of making it look more like a fox. 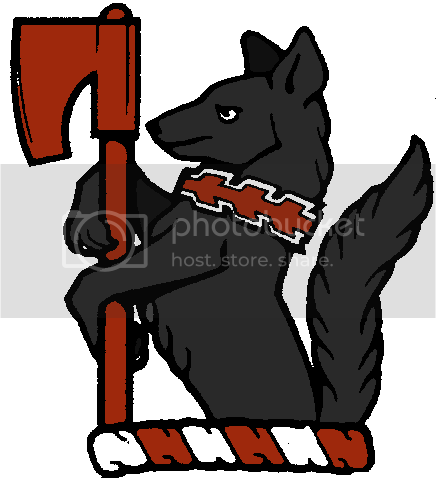 I realize that is often difficult to distinguish between various heraldic canines, so one shouldn't worry too much about it. Not to divert too far.. but in heraldic display of this (or any other type)... Is there generally and international indication of "position" socially or otherwise with a single supporter in any jurisdiction or geopolitical region other than as a decorative item? Boutell says only: "There are also occasional instances of a single supporter placed behind the shield" and "In Scottish heraldry....the marked distinction being a more frequent use of single supporters in the earliest examples". The use of a single supporter seems to have occurred virtually exclusively in the medieval period when supporters were still something of a novelty. The restriction of supporters in England and Scotland to members of the peerage, Knights of the Garter/Thistle/St Patrick and "G"s (as well as to Corporations for reasons that escape me) dates from the late 17th century. A few Baronets seem to have persuaded the heralds that they too were entitled, but their presumption was not long-lived. The Oxford Guide to Heraldry delves more deeply into these matters (in chapter 6) than does Boutell. As to why so few instances of a single supporter are to be found, I suppose once the common practice came to be a pair, there would have been precious few grantees who would wish to restrict themselves to just one, lest people thought that they were somehow inferior to those with two. I believe the lack of usage of a single supporter has a lot to do with the function of supporters as a design element. A Set of supporters fill in empty space around a shield and provide visual balance. The most common single supporter being a displayed eagle does the same thing, as well as any single supporter behind the shield. Single supporters are also used in statuary, such as the Queen's Beasts. Of course, there are possibly some that may have worried that having only one supporter might be interpreted as indicating inferior rank to those with two. I don't think it was ever a rule though.